Usually (not ice fishing), Whitefish are caught in the early spring or in the Fall when they migrate to areas with current such as rivers or narrow flows in the lake system. Whitefish have very small and tender mouths which is why most people who catch Whitefish were Walleye fishing while using really small hooks and minnows or really small jigs. You don't have to wait for a freak chance to catch a Whitefish. Just follow some rules for the different seasons. When the May Flies start to hatch, the Whitefish will move out of the rivers and stay just below the surface of the lake feeding on the hatching flies. When the May Fly hatch is complete, the Whitefish go deep. You can catch Whitefish on the surface in the spring with small spinners, 1/16 oz jigs, tiny Rapalas or putting a May Fly or wax worm on a hook and a small float and just cast off the boat. Generally, the Whitefish will be everywhere there are large populations of May Flies hatching on the surface. This is a perfect time for Fly-Fishing for Whitefish with your fly-rod. Use your regular fly-rod and regular line but the lead line should be 4 pound test. Use a fly that looks like a May Fly. Other flies might work well but remember, the Whitefish's visual acuity this time of year is for the shape and movement of the May Fly. Do exactly what it says in the Lake Trout Section. Whitefish are a deep water fish and go deep during the Summer. Use a three-way swivel system with a Zero Mepps, or Blue Fox or small black and silver Rapala and troll very slow in about 35-55 feet of water. Whitefish spawn in the Fall. They migrate into rivers or near the shore that has a sandy base and basically spawn in the same spawning beds as the Walleyes. During the spawn, the Whitefish only feed during the day, which is the exact opposite of most fish. You will find that as soon as it gets dark, the fish lose all interest in food and concentrate on their spawn. During the end of the spawn, they may start to feed before they travel back to the lake. Generally Whitefish will stay shallow all Winter. In the Spring, they feed on Walleye eggs again and do not go deep until after they gorge themselves on the spring May Fly hatch. 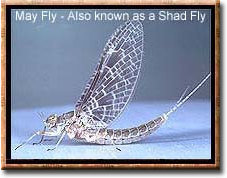 May Flies are called May Flies everywhere in North America except North Bay, Ontario where they are called Shad Flies. You may want to know this if you have been fishing near North Bay and were wondering what the difference was. Generally small is the word. Small baits and lures must be used. Whitefish will hit a bigger lure like a Rapala or Thunderstick but generally the hooks on these lures are too big for the Whitefish's tiny mouth.